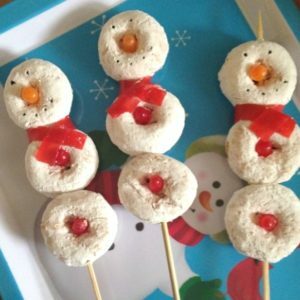 November 23, 2014 0 comments on "Snowman on a Stick"
If you need a quick treat for a children’s holiday party, this snowman on a stick is a really easy to make and cute too. If I can make these cute snowmen, you can too! They only take a few minutes to make. You will need three donuts for each snowman. First carefully poke a skewer through three of the donuts to form the first snowman. I first tried using long lollipop sticks because I thought they would be cuter, but you really need something like a skewer that is sharp on the end to go through the donut without breaking it. Use the Mike and Ike’s candy to form the snowman’s nose and buttons. You can either leave them whole or cut them in half. I found they fit in the holes better if they were cut in half. To form the eyes and mouth, use a toothpick to carefully create little dots. If you have trouble finding black food coloring try checking out a local craft store such as Michael’s or Joann’s. I couldn’t find any at Walmart, but Michael’s had it. To make the snowman’s scarf, cut a thin slice of a Fruit-by-the-Foot and wrap it around the snowman’s neck. I made six snowmen, and one Fruit-by-the-Foot was enough for all of the snowmen. It’s a good thing, because I think there was only one left in the box by the time I got around to making the snowmen! That’s it! These can be stored in an airtight container for a few days, maybe a week, depending on how fresh the donuts are. 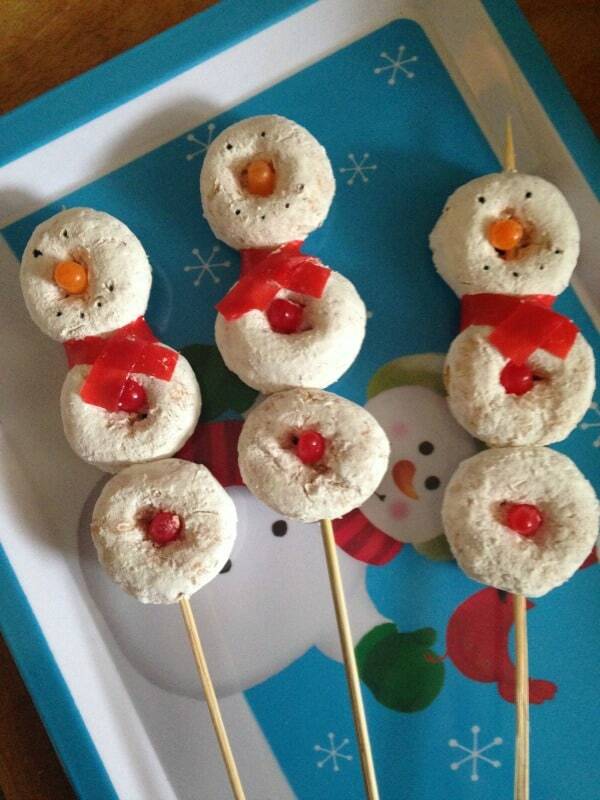 If you have an elf on the shelf, you can have him “make” the snowmen on the stick and surprise your kids with them for breakfast! Follow my Christmas and Favorite Recipes boards on Pinterest.